Home ishqbaaaz Ishqbaaaz 4th July 2018 Episode Written Update"Anika tells Daksh's Truth to Shivaay He Throws her Out"
Ishqbaaaz 4th July 2018 Episode Written Update"Anika tells Daksh's Truth to Shivaay He Throws her Out"
Ishqbaaz episode starts with Anika gets suspicious about Daksh. She tries to tell Dadi about Daksh’s misdeed. She thinks to confirm about Daksh’s presence with Payal once. She gets tensed. 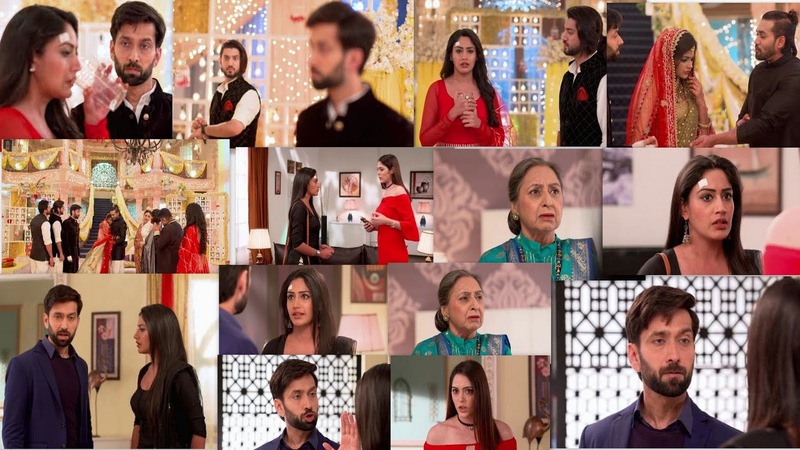 Shivay tells Anika that he doesn’t like her, but if Priyanka has chosen her as the wedding planner then he will pay her all the respect, and even his family will respect her. He asks Anika to take care of all the arrangements well. He doesn’t want to tolerate anything wrong. Anika doesn’t know if Daksh is really the guy who misbehaved with her. Anika doesn’t understand to tell the truth to Oberois. She thinks it would be wrong to let Priyanka’s marriage get done with Daksh if Daksh is really wrong. Omkara tells Anika that shivay is really emotional about Priyanka, they lost their parents at a young age. He tells Anika that Shivay has raised Priyanka alone. She connects with Shivay, as she has also raised her siblings alone. She tells Omkara that she understands Shivay completely. Anika sees Priyanka getting pampered by everyone. She thinks if being silent would be right in this situation. She doesn’t want Priyanka to regret all her life by marrying a wrong person. She thinks she would have spoken up if this was about Gauri’s future, she should go ahead and stop Priyanka’s destruction too. She goes to Shivay to tell him about Daksh. She gets in dilemma. She finds Priyanka too concerned for Daksh. Daksh tells Priyanka that its a small wound, he is fine. Shivay asks Daksh to show his wound. Daksh shows Priyanka’s name tattoo and surprises her. He tells her that he wanted to show the gift later. She gets pleased with his gesture. She asks him how did he bear so much pain. Daksh tells Priyanka that he can bear any pain for her. Anika feels Daksh loves Priyanka a lot. She goes to meet Payal to know about Daksh. She asks Payal about Daksh. Payal has an affair with Daksh. She defends Daksh. She tells Anika that Daksh was here to collect his costume. She fools Anika and tells her that she will accompany her to the Oberois to help Priyanka, who is really like a friend for her. Anika takes Payal to Oberoi mansion. She meets Dadi and tells her that Priyanka shouldn’t marry Daksh, as he isn’t a nice guy. Shivay overhears and yells at Anika for ruining Priyanka’s happiness. He asks Anika to stop her nonsense about Daksh. Dadi gives a chance to Anika to prove herself. Payal comes with a plan and lies to them about Daksh. Anika tells about Daksh’s misbehavior. She tells the complete incident to them, and shocks them. Shivay doesn’t believe Anika. Dadi sympathizes with Anika knowing everything. Anika asks Shivay not to ruin Priyanka’s life. Shivay tells Anika that Daksh came the other day. Payal lies to them and clears Daksh’s name from the mess. Anika is proved to be a liar. She doesn’t know why is Payal lying. Daksh gets informed that Anika is trying to break his marriage. He lies to Payal and tells her that Anika tried to trap him, that’s why she is putting such allegations on him. He makes Payal lie and save his image. Shivay asks Anika not to lie further. He tells her that he has went to collect Priyanka’s dress and got it. He asks Anika why didn’t he see her or Daksh there. He doesn’t want any problem in Priyanka’s marriage. He refuses to listen to anything and asks Anika to leave from his house. Anika comes to Priyanka's Room and Sees her On Floor Couching She Rushes to her and pats her back and shouts for Help Shivaay reaches to them.